Rep. Frederica Wilson (D-Fla.) took a victory lap in her feud with President Donald Trump after the White House was caught falsely maligning her for the second time this week. 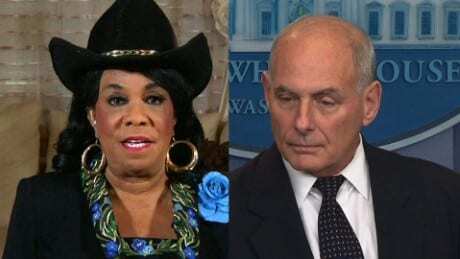 Twice this week the White House accused Rep. Frederica Wilson (D-Fla.) of lying and each time the facts have vindicated her version of events. Most recently, evidence emerged disproving an accusation by White House Chief of Staff John Kelly that Wilson had gloated over securing funds for an FBI building in her district. Earlier this week, Wilson escalated a political firestorm over President Donald Trump’s response to the deaths of four American military service members in Niger. After bragging of his willingness to call the families of fallen troops, Trump spoke with the loved ones of the most recent casualties, including Myeshia Johnson, the widow of Army Sgt. La David Johnson, and a constituent of Wilson’s. Trump responded the following morning by alleging that Wilson “totally fabricated” the conversation and claiming he had “proof” that her version of events was not true. Then, on Thursday, La David Johnson’s aunt Cowanda Jones-Johnson, who said she was also present during the call, corroborated Wilson’s version of events. Caught in a lie, the White House, which had never offered evidence to contradict Wilson’s description, quickly shifted its public relations strategy. In remarks to the White House press corps on Thursday, White House Chief of Staff John Kelly suggested that Trump spoke appropriately. Kelly, whose own son died serving in Afghanistan, recalled his son’s commanding officer saying something similar. But in keeping with Trump’s relentless combat with critics, Kelly could not resist taking another false potshot at Wilson. As part of a larger attempt to paint Wilson as a political showboat, Kelly alleged that Wilson had taken credit for securing the federal funding for the construction of a new FBI building in Miramar, Florida. Kelly was present at the 2015 ceremony dedicating the building in his capacity as head of the U.S. military’s Southern Command. “A congresswoman stood up, and in a long tradition of empty barrels making the most noise, stood up there in all of that and talked about how she was instrumental in getting the funding for that building, and how she took care of her constituents because she got the money, and she just called up President Obama, and on that phone call, he gave the money, the $20 million, to build the building, and she sat down,” Kelly said. Here too, Kelly was either gravely mistaken or deliberately lying. The legislation allotting the federal funds for the creation of the building passed Congress in 2010, shortly before Wilson began her first term in office, McClatchy reportedon Friday. Instead, Wilson drew praise at the ceremony from Republican Rep. Ileana Ros-Lehtinen (Fla.) and then-FBI director James Comey for pushing through legislation naming the buildings after two deceased FBI agents. Wilson during her ceremony speech took credit for ensuring that the buildings were named after the agents, but not for securing the funding, according to a video of the event obtained by the Sun-Sentinel. Previous articleTrump Tried To Look Compassionate. Instead, He Looked Like A Jerk.